ALL such programs are a complete waste of money, no exceptions. you had a terry moment then. again job well done gerry. yes looks good, must admit though the first 15GB partition and the 36MB partition confuse me. usually i'd expect a 15GB recovery partition to have at least 10GB of data on it and i'd expect the uefi partition to be 100MB even though i don't think it's used with windows 7 so is usually 100% free. not that it matters everything works fine and you now have plenty of free space for your os, and data partitions so well done. curios nigsy why you suggest he wants to consider moving whats on d to the external? surely the external would only be used for backups and it's looking pretty full anyway with only 17% remaining free out of 2TB. can you post the same computer management screenshot as your earlier screenshot so we can see the actual drives partitions please. my biggest worry when anyone makes changes to their partitions is the boot loader gets broken so the pc won't boot into recovery options or the operating system. can you post a screenshot of your partitions now too? i'm just curious if you still have any unused space on the drive. caintry he needs to make a complete disk backup, not just the c partition, that way the boot loader/mbr etc. will be included then if anything does go wrong he can put "everything" back to how it is now and still have a booting system. once you have the backup image made gerry, seeing how the first 15GB is a factory restore partition, don't touch it and you'll just expand the d partition so it uses the unallocated space already on the drive, next move the beginning of the d partition to create unallocated space between the c and d partitions, then expand the c partition to use the unallocated space just created. it'll probably be easier for you to use either http://www.disk-partition.com/resource/free-partition-magic-for-windows7.htmlor http://gparted.org/ to actually resize the partitions because all you do is choose the resize option and then put the pointer on the edge of the partition you want to resize and drag it to where you want. so the order you'd want to do things is this, first choose resize, then place the pointer on the end of d and then drag it right until it fills the unallocated space, next put it on the beginning of d and drag it right to create some empty space. now put the pointer on the end of c and drag it right to fill the empty space. so you should now have a larger c partition next to the d partition and when everything looks right save it. thinking about it once you have just the 95GB c and 1767GB d partitions and uefi partition, next i'd look at exactly what is using most of your c partition space, if it's programs then i'd resize it to get more space off the d partition, but if it's user data/files then i'd just move them to the d partition, after all that's what it's supposed to be there for. ok you have 1 drive, we'll ignore your external, in fact if i was you i'd unplug it till we sort out your partitions. now look at your Disk 0 in your screenshot. notice you have 15GB partition, C 80GB partition, D 1660GB partition, and 107GB unallocated partition and other partitions out of view. if possible can you expand things so we can see them, but at a guess i'd say it's 100MB uefi partition. must admit it's one of the weirdest partition layouts i've seen for ages. is there a reason why you have the first 15GB partition and do you know what if anything is on it? also why the 107GB unallocated? personally i'd delete the 15GB partition once we know it's not used for anything, then expand the c partition to use that space. then i'd expand the d partition to use the 107 Gb space. now you have 2 partitions c + d plus the needed uefi boot partition on end of drive. if you still need more space then you will need to shrink the d partition (from where it joins the c partition and not from the end) and then expand the c partition to take up the new empty space shrinking d created. don't do anything though until you make a good backup of everything so if you make a mistake you can put the drive back to how it was and try again. i'd make a disc image using macrium reflect. 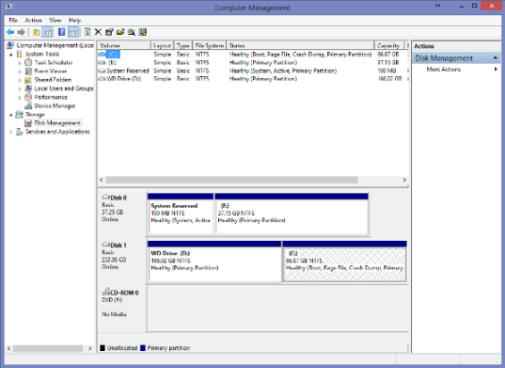 i thought you could just drag the partitions to the size you wanted in windows but i may be mistaken and am thinking of some program or other i've used to manage windows partitions. if not see my post above and then tell us (screenshot would be best) what your pc shows. i'm beginning to think you have 1x2TB drive with c and d partitions on it. and 1x2TB external drive from what you posted above. in windows drive management doesn't it show each drive and it's partitions? been that long since i've used a windows pc i can't remember exactly where you look, but it does show each "real" drive in the pc somewhere. disc 0, disc1, etc, etc. 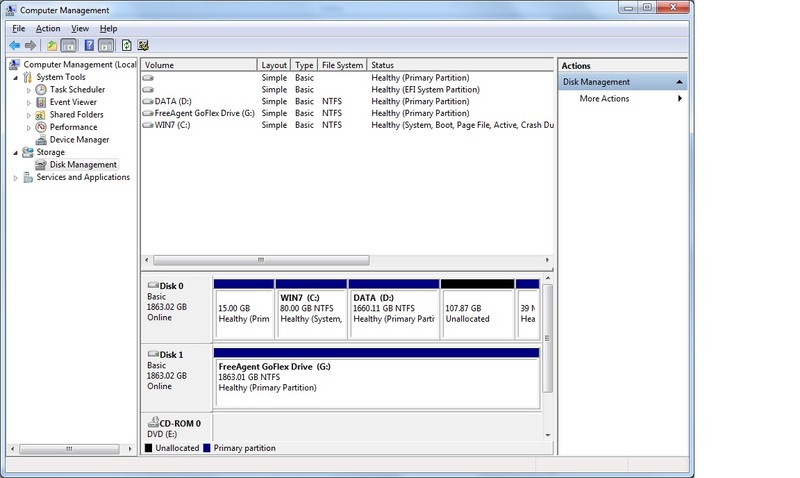 tomk's post lists the options and advice we'd recommend and only thing we'd need to know first is if you have 2 separate hard drives in your pc, or if it's 1 that's been partitioned so it shows as 2 drives in windows, don't see where you've said in topic. it's a permission problem then, windows knows it's a needed folder so probably has it tied down so only the hidden admin account can delete/make changes to it. don't have a windows pc and haven't set up virtualbox on this new install yet so i could install a windows os to test with yet or i would have done so already, also i've never used win10 and won't let it anywhere near my pc's even in virtualbox so it would be win 7 i tested with anyway. like nigsy my recommendation would be to clone the complete os drive to the larger drive and make that the boot drive as long as there is no files on there that haven't been backed up first. what you want to do is move the complete windows programs folder (and not 1 or 2 program folders inside it.) and see if things work, especially installing something new to see if it does follow the sym link and installs on the d drive when it thinks it's installed on the c drive. as everyone can see, me and y figured out why i was having smillie problems and now they work. once a sym link is used anything that installs into the location thinks it is being installed there and works except it is actually following the sym link and getting installed in the folder on the other drive if things work like i believe they should, (ie. like linux.) so there shouldn't be any problems running or installing anything new in my opinion. unlike oftentired though i have no experience with using sym links in windows os, so he may be correct and i may be wrong, but don't think i am to be honest. does the forum have something against macs and linux? i'm assuming someone's been playing with the settings because i can't get the full post options and am missing my smilies, also the above was posted in 2 parts with a line space between but when posted empty line was gone and everything is in one paragraph, happens with all my posts (after edit first post is now showing as written with space even though i did nothing to change it's layout from the way it got posted originally.). So let me see if I'm following here. tomk's link explains it perfectly, "symbolic links" are needed and not short cuts but yes essentially that is the process. in linux you get the option to "copy, move or link" things instead of creating short cuts like in windows so the process of linking folders is straight forward, just move the folder and then link it back to where it was. personally i use sym links all the time to save space on my os/home drive. if you link the original folder after it's moved to it's original location then (if things work like in linux.) then you should have no problems because everything will follow the links to the actual programs/data needed to work. no idea why but i don't get any smilie icon or quote options when i make a post so no beers at the moment. "The standard recommendation is that you should keep at least 50% of your hdd free to ensure that the drive operates smoothly"
think you'll find that's 10 to 15% and not 50% caintry. no use for such a thing myself but if it does the job for you so you can run old ubuntu apps instead of updating them or have one that died out and you still want to use it then fair enough. what are you trying to do and for what platform apps, eg. android, apple ios, windows mobile, etc. etc. ? still a ways to go though before you equal the highest spot i remember our team getting to and that was 55th, so keep up the good work. Why won't my tablet play exFAT thumb drive? no the drives are not defective the problem is for android devices to support exfat file system natively they first need to pay microsoft a licensing fee, google will not pay that fee for android to use the exfat filesystem and the device manufacturers also usually won't pay that fee for native use in their build of the android os of a file system that is not used much compared to fat32 and ntfs, therefore those devices don't have native support of exfat file system and that is why i think there is nothing wrong with your drives. there are ways around this but i think need you to root your device first before using an app like paragon. 3. How to enable exFAT support? The exFAT binaries are not included in the app. Place them at the root of your sdcard (eg /mnt/sdcard) OR in /system/bin directory. Enable exFAT option in settings. Warning: exFAT is experimental. Please do not use it with important data. If vold (in your phone) tries to mount it as FAT, it may cause data corruption even before my app has chance to mount it. This, or other reasons can cause data corruption. You have been warned. The developer of this app will not be responsible for any damage or data loss. don't think the mods will like it if you post every one of your youtube videos in individuals topics, so if i was you i'd just put a link to your youtube channel in your signature, then every time you make a post in any topic (either helping people, asking for help or just in a general discussions here) people will get a chance to see it and click on it if they want. I wanted to reduce the possibility that running Eve combined with whatever else you multi-tasked was exceeding your system resources by such a degree that the system connection performance was compromised as it attempted to manage the high video rendering demand. that's exactly what's happening in my opinion, the cpu is overtaxed supply data to the gpu rendering the dual displays along with the other tasks it's doing which causes the internet connection drivers to fail/freeze, requiring them to be reloaded before internet works again and why it never happens when only using 1 monitor. see if these links better help you trace and find out where the problem is when you lose your connection. eg.netsh command. if you can't then find and fix the problem on your own, post any trace logs and errors in your next post so someone here may be better able to help you pinpoint where the problem is.